GOLD LED Screens is an established LED display and LED screen manufacturer and global wholesaler of full color LED displays and LED screens leveraging several years of experience in the LED display market with a broad portfolio of governmental institutions and small to large sized companies. It's founded by a number of LED elitists and had been dedicating itself to offering one-stop LED display solutions to its customers across the globe. GOLD LED Screens is in a good position to provide comprehensive services including: R&D, design, prototyping, assembly and turnkey technology support. Also, GOLD LED Screens strong production capacity allows it to span a wide range of products covering: Outdoor Full-Color LED displays, Indoor Full-Color LED Displays, Indoor Dual/Single Color LED displays, Outdoor Dual/Single Color LED displays, Stage & Bar Displays, Unit boards and Outdoor Panels. With high quality and competitive price, GOLD LED Screen products had been exported into world markets, such as Southeast Asia, North and South America, Europe, South Africa, Middle East, etc. and enjoy good reputation for its added value. Against the backdrop of ever-changing business world, we are focusing all efforts to higher-quality LED displays and we hereby are looking forward to your positive support and cooperation. 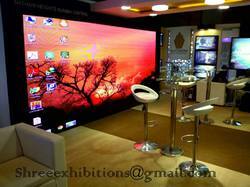 Why Choose GOLD LED Screens? Ø Our LED Display Screens have a warranty up to 5 years (depending on the configuration). GOLD LED Screens has been marching on under well-established values that guide how our staff members go always on the right track. We will regularly review and update these values to reflect current priorities and strategic business goals. We are supported by a team of dedicated and dexterous professionals. These professionals hold immense experience and expertise in their respective domain. Our professionals work in tandem with each other in order to achieve the organizational goals and targets. We organize several training sessions at regular intervals of time in order to keep them updated about the latest trends and technologies. Moreover, our professionals even upgrade the offered range of products as per the feedback and suggestions of the customers. We have developed a state-of-art infrastructure unit sprawled across a wide area. Our entire unit is well-equipped with advanced technological equipment and machinery that helps in conducting the entire production processes in a streamlined manner. These machinery are handled by a team of qualified experts, who ensure the meticulous execution of the entire production process. Within a very short span of time, we have position ourselves as one of the leading organization in the industry. Besides, we have been able to prove our credibility in the market due to the ethical business policies, customized solutions and transparent dealings. As an experienced company involved in manufacture, wholesale, retail and trading of quality electro automation products, we have been ensuring flawless products. Having gained reputation for quality compliance and reliable services we never compromise with the interest of our clients. We are privileged by the support of specialized team and state of the art infrastructure helping us to stand committed with vision of client satisfaction.